Justin Galloway is one of the most talented cartoon map artists in the world. He possesses the unique ability to create cartoon renderings of cityscapes completely by hand without the use of architectural programs. The results are beautifully rendered cartoon depictions of cities, campuses or tourist destinations, complete with buildings, streets, vehicles and caricatures of local people. Justin is a master of this very unique art form and his personal style easily stands out from other types of cartoon maps. 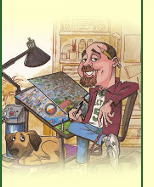 He has been hired by cartoon map companies to draw cities, towns and communities in California, Texas, Georgia, Nebraska, Iowa, New Mexico, Arizona, Utah, Idaho, Wyoming, Wisconsin, Connecticut, Florida, Kentucky, and Rhode Island...all from the comfort of his studio. He’s even been commissioned to draw cartoon tourist maps of Bangkok, Thailand. If you own a cartoon map business already, or would like to commission Justin to draw a city or area, please call 678.464.3055 today for a quote. Justin’s whimsical cartoon maps draw businesses and community together!